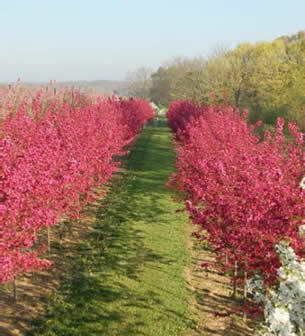 Valley Hill Nurseries has been providing quality shade and flowering trees to wholesalers since 1972. A lot of things have changed since we opened our doors back then. We’ve gone from keeping books of records and writing out receipts on 5 carbon paper, to doing everything online. But, through all the changes the business has made; the trees have remained a welcome constant. We still grow some of the same tried and true varieties that we did back in 1972: October Glory, Red Sunset Maple, Redbud, Skyline Locust, and Red Oak; to name a few. We still grow our trees with many of the same techniques we did in the beginning. We transplant into the fields basically the same as we did back then; and hand trimming with Felco #2 is still the best way to get the branch structure we need. Our trees range in size from 1.75″ – 5″, and are guaranteed to provide beauty and shade for years to come. We at Valley Hill Nurseries take pride in those long-standing traditions. Stop by and see for yourself why sometimes the “old way” is still the best way. Hours of Operation: Monday – Friday 8:00 a.m-5:00 p.m.